True hospital beds are very expensive and their price is prohibitive for most people. In the home health care or durable medical equipment industries, a hospital bed is somewhat less complicated and much less expensive. The information below refers to the type of hospital beds most people have in their homes. 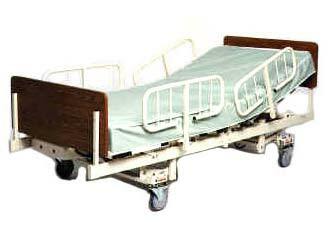 Home hospital beds are known as single, double or triple gatch beds and can be either manual or electric. A single gatch bed has an adjustable head section which will elevate the head of a patient. A double gatch bed will elevate the head and the feet of a patient independently. A triple gatch bed is a double gatch bed which is adjustable in height. All three gatches operate independently. There are several varieties of home hospital beds and the the following information should help you understand the differences and choose the home hospital bed that best suits your needs. There are a few reasons why raising the head of a bed is beneficial for the patient. Some people need to have their head elevated while sleeping for medical reasons but for other it is often an issue of comfort. Anyone who is confined to a bed for long periods of time need to be able to change their position fairly regularly for comfort and to prevent pressure sores affecting the skin. The single gatch bed will enable sitting upright for those who are unable to sit upright on their own also. Having the feet elevated in a bed is helpful for people who sit up in bed for periods of time. People will tend to slide down in the bed when sitting upright with their legs out straight in front of them. This sliding tendency is known as shearing and is very damaging to the skin on a patient's buttocks but raising the legs will tend to cradle the patient when sitting upright and greatly reduce the shearing effect. There are also some medical conditions which may require having elevated legs for a period of time. You might picture in your mind a person in a double gatch bed with head and feet raised sitting in a "V" shape but this is not the case. When the feet are elevated, the knees actually are higher than the feet so the effect is similar to sitting in a lift chair or recliner one might find in someone's living room. The third gatch which adjusts the height of the bed does not change or affect the positioning of the patient. While being able to adjust the bed height may facilitate easier transfers or access by the patient, this feature is primarily for the care giver. Changing diapers or dressings, bathing and medical treatments or therapies can be very uncomfortable for the care giver or medical professional. Being able to position the patient at the proper height is a very worthwhile option when purchasing a home style hospital bed.